I wore sandals yesterday. We hit 75 degrees. Two days ago the low was 24. That's how it goes around here, toying with me, a hint of spring, then cold again. 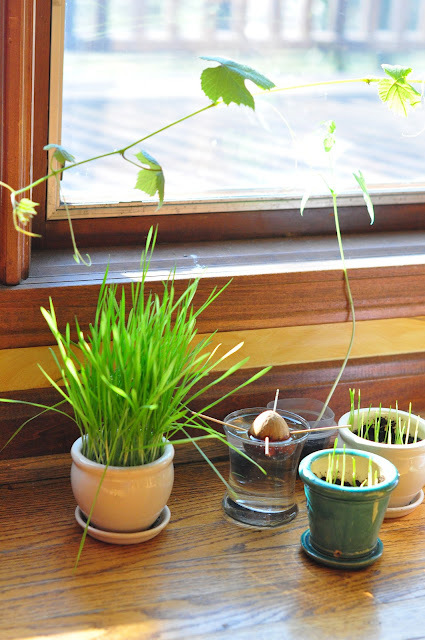 But as you can see, the window sill is filling with plants - giving an avocado seed another try (last time we couldn't get it to sprout), there are several bean plants, as well as my grape vine from last year that is waking up. And the wheat grass? Getting ready for the presentation on the Mystery of Life and Death in the atrium!